ATLAS 2 1280-|| - further development of the dining table Atlas with a new extension mechanism. For some years the Atlas dining table is an integral part of the collection. After a further development the Atlas 2 was created. This rectangular dining table convinces by its modern strictness. A patented technique allows the extension top, which is integrated under the main table top, pivoting playfully by a ball bearing, but keeping the symmetry to the pedestal in the open or in the closed position. While pulling out the extension top, the main table top moves spectacularly by a sliding bearing guide in longitudinal direction. The extension top will then be lifted at the front side by a spring support, in order to lift it to the same height as the main table top. With the new technique the extension top can be rotated by another 90°. Then this extension top is positioned lengthwise under the main table top and is no longer visible from the side. 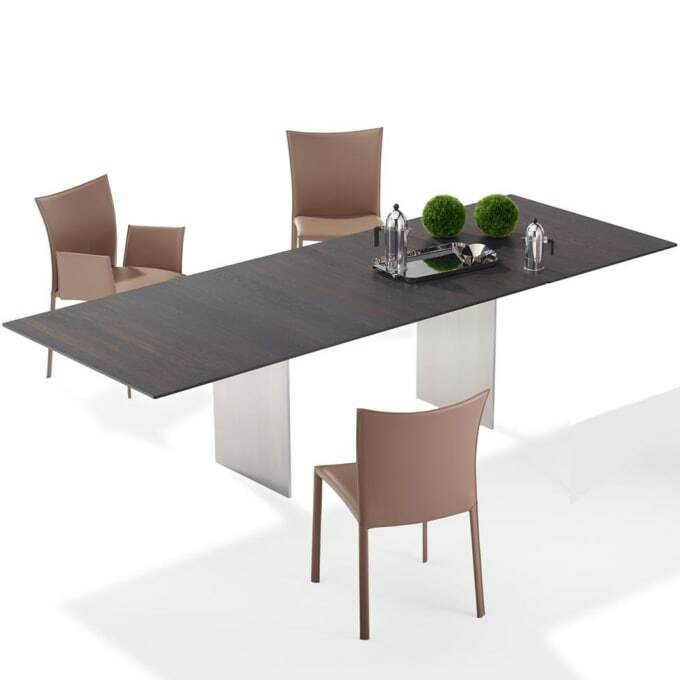 The dining table ATLAS 2 is offered in various variants, this model here has straight walls (standard base). Do you have a question about "Atlas"? How can we contact you?